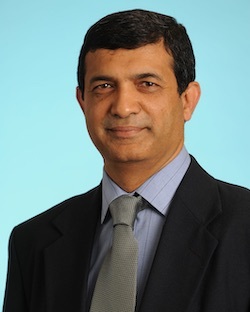 Anjaparavanda P. Naren, PhD is Professor of Pediatrics and Thomas Boat Chair in Cystic Fibrosis Research at Cincinnati Children's Hospital Medical Center since 2013. He is also the Co-Director of the Cystic Fibrosis Research Center. He received PhD in Biochemistry from the Indian Institute Of Science (Bangalore, India) in 1993. He did his Post-Doctoral training at UAB (Birmingham, Alabama) and joined the Physiology Department at University of Tennessee, Memphis in 2001. The research in Dr. Naren's Laboratory is focused on defining the cellular and molecular mechanisms of how protein-protein interactions regulate CFTR in diseases such as Cystic Fibrosis and Secretory Diarrhea. His laboratory also deeply interested in developing personalized model systems to study CF and CFTR-related disorders. Dr. Naren has authored more than 70 articles in peer-reviewed research journals such as 'Cell', 'Nature', and 'Science' to name a few. Research in Dr. Naren's laboratory focuses on defining the role of Macromolecular complexes in regulating the functions of the Cystic Fibrosis Transmembrane Conductance Regulator (CFTR), which is a cAMP activated chloride channel present on the apical surfaces of epithelial cells. CFTR is responsible for salt and water transport across epithelium, and dysfunctions of CFTR are responsible for several diseases, including cystic fibrosis (CF) and secretory diarrhea. In CF the synthesis or the functional activity of the CFTR Cl- channel is reduced. This lethal, autosomal recessive disorder affects approximately 1 in 2,500 Caucasians in the USA. Excessive CFTR activity is implicated in cases of toxin-induced secretory diarrhea (e.g., by cholera toxin and heat stable E. coli enterotoxin) that stimulate cAMP production in the gut. Although Dr. Naren's laboratory works on several interrelated projects, the main projects they are currently focusing on are: 1. Macromolecular complex of CFTR regulates tracheal secretion. 2. CFTR-dependent protein interactions regulate secretory diarrhea. 3. To identify small organic molecules that augment or inhibit CFTR function by perturbing CFTR-dependent protein interactions. The laboratories research involves several complimentary approaches in understanding protein-protein interactions in vitro (tissue culture) and in vivo (CF-knock out mouse model). Techniques such as two electrode voltage clamping (TEVC), Ussing Chamber, Iodide efflux measurements, FRET-imaging, Single Particle Tracking (SPT), molecular biology (cloning), protein purification and protein binding assays are some of the methods currently used to address studies listed above.